New for 2019. Watch live video stream from the Channel Islands of the Alderney Puffins from April to July 2019. Fortnightly blogs on the breeding cycle of the Puffins will be posted on the See Nature and Alderney Wildlife Trust websites from April to July 2019, looking more closely at the life cycles, behaviour and conservation of these amazing birds. So join us in 2019 and learn more about The Puffin. 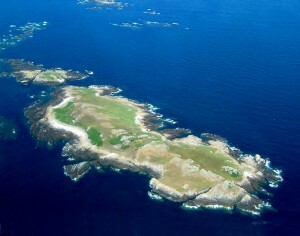 The Alderney Wildlife Trust is responsible for the looking after and protecting the wildlife that live on the small Island of Burhou. Trust Staff make regular trips by boat to the island to check the rabbit burrows and ensure that gulls and other predators are kept away from the young Pufflings and the entrances to their burrows. Each week throughout April, May and June 2019, Alderney Wildlife Trust staff will be posting regular updates on our Puffin blog so that you can keep up to date with the progress of the young Puffling chicks. Just days away from the arrival of the adults Puffins on the island here is Claire from the Trust with a message about what is going to happen on Burhou over the coming weeks. 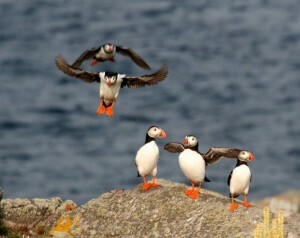 “The puffins will arrive back in Alderney very soon; usually they will be spotted on land in the first week of April. As you will have also experienced, it has been quite a rough start to the year with lots of bad weather and, sadly, a recent oil spill off the nearby French coast may have killed some of the adult Puffins out at sea. The Alderney Wildlife Trust will be monitoring the puffins as usual this year, counting the number of birds sitting on the water (called rafting) and using surveys and puffincams to help determine the number of breeding pairs. We hope the weather and pollution won’t mean numbers are down this year! On Burhou the Puffins build their nests in old rabbit burrows or on the side of the cliffs. Once they have made a nest the male and female will return to the same nest every year! Eggs are laid in the burrows in late spring/early summer. Both the male and the female take turns incubating the egg, with incubation usually taking between 36 and 45 days. Once the egg has hatched the parents take turns leaving the burrow in search of food for the Puffling chick. 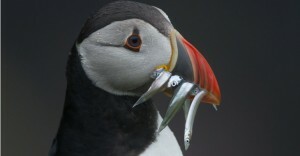 Sand eels are the favourite food of the Burhou Puffins. An adult Puffin diving beneath the water can hold up to 10 sand eels in its beak at any one time. To hold this number of fish Puffins use the rough spines on the roof of their mouths to avoid dropping their catch. 10 incredible Puffin Facts – Did you know? The Atlantic Puffin is one of four species of puffin and the only one found in the Atlantic Ocean. A colony of Puffins living at sea is called a raft? A group of Puffins is called a circus! 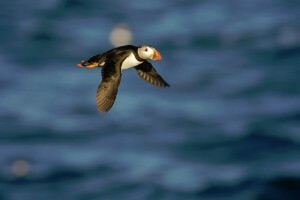 When diving to catch fish Puffins can stay under water for up to 30 seconds! Puffins usually hold up to 10 small fish in their beaks. The record catch by one single Puffin was 62! A Puffin's beak is made of Keratin just like the human finger nail! The average life span of a Puffin is between 20 and 30 years. Puffins are one of the smallest sea birds. They are about 18 centimetres tall. Puffins do not start to breed until they are 5 to 6 years of age. Puffins can fly at a speed of up to 45 miles per hour. To achieve this speed a Puffin will flap its wings 400 times a minute!